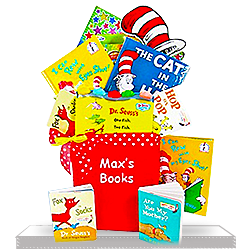 A perfect Gift Basket for little genius comes with a 12 board book Library from Baby Einstein Company and one bigger board book called “Let's Look”. 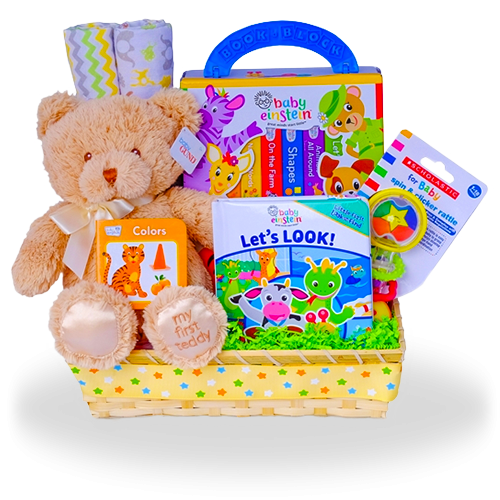 Multicolored books are packaged up with a cute Teddy Bear from Gund that has the sweetest embroidery on it saying "My First Teddy". So sweet! 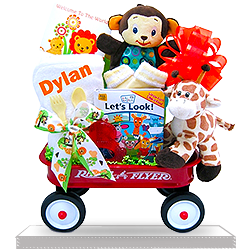 The set also includes two super soft Flannel Receiving blankets and a Scholastic Rattle. 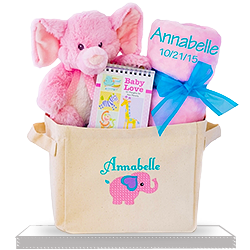 Comes with Coordinating Ribbons and an Organza Bag." Great to have found your web site. Nice job! Thanks so much for making me look really good. Your gifts never disappoint! Very nice. 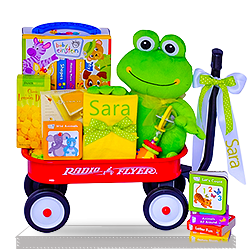 Great gift baskets and prompt delivery. I heard it was a very good quality. Would definitely recommend this service. Outstanding! My sister was really pleased with this gift. The customer service is superb. Easy to use website and excellent customer service. The entire transaction was very easy. The gift was delivered very timely and the recipient loves it. The presentation was beautiful and the quilaity product excellent! The package arrived in time stated, it was good presentation and good quality items. Can't wait to use your services again. 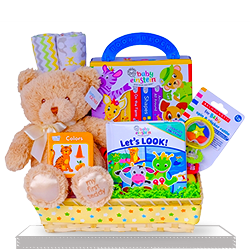 Many items are in the Reading with a Bear Baby Einstein Gift Basket. The recipients loved it and want to order as a gift set for their friends. The products were very nice. The basket arrived earlier than expected, which was great. I plan to use your site again next time. I was very worried that it will send the day before the delivery date but thankfully it was on the exact date! We were suprised to see how beautiful was the basket. Super impressed with the shipping speed. Thank you for getting this to them so quickly, you are wonderful !!!!!!!!!!!!!!!!!!!! The presentation is beautiful. Quality of products appears to be top-notch. Highly recommended. I am very pleased I found your web site first. The package was delivered in the estimated time and I received a photo of the recipient holding the basket. She was very pleased with it. Beautiful presentation everything is perfect!!!!!!!! 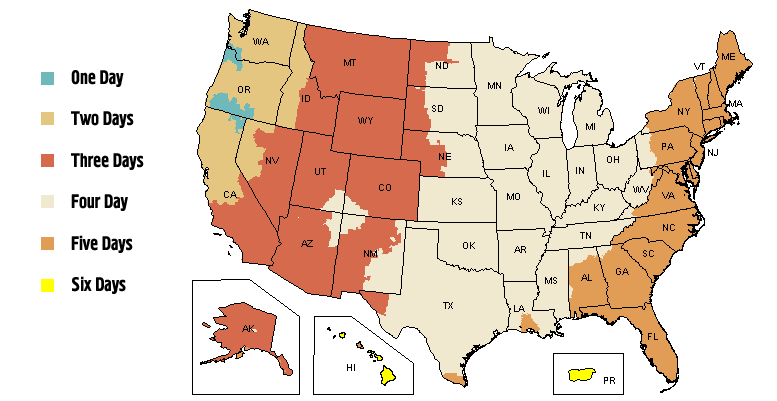 The website was easy to navigate. 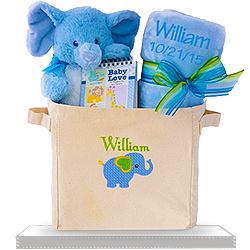 We will definitely use Giftbaskets4baby again. The delivery time was good and the package was in great condition. I will definitely use this again and highly recommend this if you are looking for a gift basket for a baby. Great quality, fast shipping. The family that I sent this to loved it. I would buy it again if the occasion happen! The gift was exactly what was expected. Selection was delightful and the presentation of items in gift basket was perfect. My friend did send a picture and it looked very nice. First time we ordered. So glad we tried. Great product and arrived on the date promised. Would give this gift again. Very happy with my purchase. The products have always been good quality. It arrived on time and it looked beautiful. It was beautifully arranged and was a huge hit! She loved it. I love everything about your Company!!!!!!!!!! I bought this for my sister who is going to have a son and she loved it a lot. The basket arrived on time and looked lovely. I’m pleased with everything but price. Joy for my new nephew and his parents worth it but I can’t afford any purchases in this month after buying this.